Few people know or care about Slovakia, except those who live in it. When UK Foreign Secretary Jeremy Hunt went to Slovenia recently and referred to it as a “Soviet vassal state”, he demonstrated that even a foreign minister can’t tell the difference between Slovenia (which never was) and Slovakia (which was), which sums up the respect the country is generally held in. Now Slovakia has gained a place in the news by electing a new president who is regarded as “liberal”. Slovakia is generally lumped in with other regional countries such as Hungary and Poland, whose governments make a virtue out of being anything but liberal, and Viktor Orban openly campaigned against Zuzana Caputova, which ironically put him on the same side as EU Commissioner Maros Sefcovic. But Caputova prevailed, to be elected Slovakia’s first female and youngest president, forcing a public rethink of what Slovakia is supposed to be amongst those who never thought much about it to begin with. Liberal states are prosperous, Slovakia is not. Liberal states have long traditions of relatively accountable government, Slovakia is tolerated as a corrupt backwater still trying to shed in Soviet past, exemplified by the fact that about a third of Bratislava’s population still lives in the same Soviet-era apartment complex. In reality, these sudden experts on Slovakia should not have to think hard. Caputova presented her campaign as “good versus evil” struggle, and the behaviour of the Slovak government over murdering journalists made this claim resonate. She is also an attractive blonde woman with a known track record as a human rights lawyer, exactly the pedigree assumed to support such a claim, rightly or wrongly. Her victory is also, rightly, being bracketed with the success of Volodymir Zelenskiy in the first round of the Ukrainian elections. He too is a political outsider, a comedian in the mould of Bepe Grillo, founder of Italy’s successful Five Star Movement. So already it is being claimed, rather simplistically, that this provides evidence that Ukrainian elections are no longer being rigged, although people outside the political system might have to rig elections even more to get near to winning them in a corrupt system. But what both contests show is that populism is, as should have been expected, something which does not distinguish between left and right, liberal or reactionary. Whatever the political class are deemed to be, the right person can gain great traction just by being the opposite. People are no longer voting for this or that alternative, but to burn the whole house down – even when they have no idea what to replace it with, as the ongoing Brexit saga has made clear. So where does this leave Slovakia, Ukraine and the increasing number of other countries where this has happened? If order is going to be replaced with anarchy, what sort of power does that actually give people? 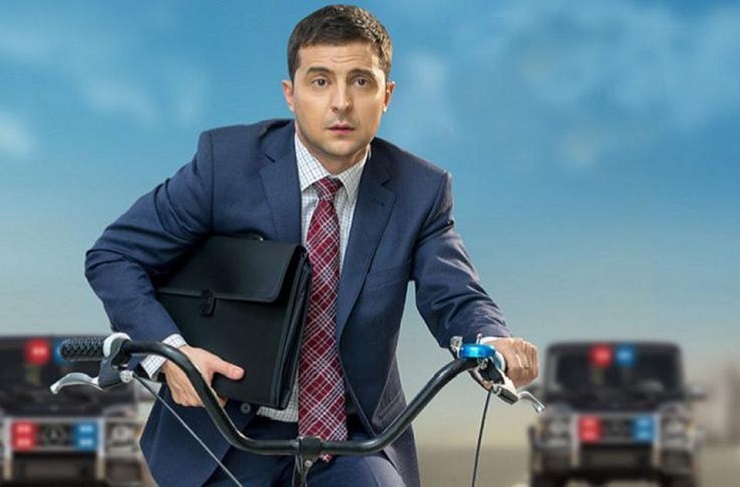 There are two obvious parallels to Zuzana Caputova and Volodymir Zelenskiy. The fates of Mary Robinson, the former President of Ireland, and Stuart Drummond, the former Mayor of the UK port of Hartlepool, provide pointers as to what might happen to their modern counterparts. Mary Robinson was also a lawyer, and didn’t trade on her looks but was happy for them to be used to her advantage by others. She was also a political outsider, being elected to the Irish Senate as an Independent and later joining the Labour Party, a minor force in Ireland, only to resign from it again in protest. The Labour Party had no hope of winning a presidential election with one of its own candidates, so some of its senior members approached Robinson to represent them, in spite of her resignation. She was not expected to win the internal Labour nomination process for the 1990 election, let alone the presidency itself, but she used her independence and principled behaviour to good advantage in a country grown tired of the same two parties and their very similar styles. With the expected victor, Fianna Fail’s Brian Lenihan, being torn apart by this own party and Fine Gael’s Austin Currie proving unequal to the task, Robinson gained enough votes to force a runoff and then won it with Fine Gael transfers, although it had been considered impossible for any independent candidate to do this. She became by far the most popular president in Ireland’s history by continuing to stand above party concerns and supporting the same causes she always had, making the presidency into a serious office, rather than a dumping ground for old failures, for the first time since the iconic Eamon De Valera, against whom all Irish presidents are judged. But where are the Robinsonists now? One should keep in mind that the Labour is still a minor party, and Robinson fans cross party lines but remain within the same structures as before. Robinson ended her term early to take up a role at the UN, where she continued to fight her pet causes, as she still does in other roles today. But the Irish political boat did not capsize, it simply swallowed as much of Robinson as it was prepared to and continued as before, with Robinson seen as a once in a lifetime phenomenon, like the popular movement which elected her. Prior to his election Stuart Drummond was better known as H’Angus the Monkey, mascot of Hartlepool United Football Club. As his name implies, he wore a monkey suit, in reference to a local legend. When the Mayor of Hartlepool became directly elected, rather than elected by the council, in 2002 Drummond stood for election as a publicity stunt, making one single campaign promise – free bananas for schoolchildren. Drummond did not take part in any of the public candidate forums, and made no serious attempt to campaign. Nevertheless he beat the official Labour candidate, in this UK Labour parliamentary stronghold. He even forced embarrassed local MP Peter Mandelson, a high-profile national figure, to state publicly that Drummond had been a serious candidate all along, and that his campaign was about more than bananas, exactly the opposite of what Mandelson’s party had said during the campaign itself. Drummond went on to win two more elections, trading on being the independent “man of the people”, the first directly elected mayor in the UK to do so. He might have carried on winning elections, had Hartlepool not abolished the mayorality altogether, with him still in post. But again, there are no Drummondists in Hartlepool. He himself largely co-operated with the Labour group on the council, and Hartlepool politics remains as it ever was, despite the populist wave which elected the monkey. Zuzana Caputova and Volodymir Zelezniy represent all those who are tired of politicians, as do the leaders of Syriza in Greece and Podesmos in Spain, Five Star in Italy and En Marche in France, and also (from their very different perspectives) Donald Trump and Justin Trudeau. But what then? When the people have re-established the voice which should always have been theirs in a democracy, what difference will their election actually make? Slovakia and Ukraine aren’t likely to develop new political parties, at least anytime soon, or do away with them altogether, as a result of populists getting all these votes. But they may force their political systems to embrace new ideas for a while, even though the system itself will ultimately weed them out. There are lessons to be learned: Portugal had its Carnation Revolution in 1974, conducted by Marxist army officers who overthrew a right-wing dictatorship which was a relic of the days when these were in fashion. Their slogan was “The Armed Forces Movement is on the Side of the People”, and to a large extent this was true, although this didn’t mean the people were supposed to be consulted. The new Portuguese Constitution declared that one of the aims of the country was to achieve socialism. It mandated liberal freedoms and regular parliamentary elections as the means of doing this, when these were anathema to other “socialist” states of the period. But many of the leading figures in that revolution made it clear that only hard left solutions were appropriate for Portugal, and assumed that the population, which had largely welcomed the coup, would agree. When those elections happened, Portuguese voted for the same middle-class parties you find in any country. Though the main ones were the Socialists and Social Democrats, the latter eventually swung to the right and became in effect a conservative party. But what followed next is more revealing, and one needs to keep this in mind as a predication. In 2011 Portugal asked for an IMF bailout. As was pointed out at the time, this was not justified by the actual state of the Portuguese economy, or even the attacks of bond traders. It was effectively a Social Democrat con, designed to rid the country of its socialist priorities by IMF diktat. Does that sound familiar – and one can make comparisons to South America as well. Some protestors invaded parliament to drown out the Prime Minister by singing the song which had launched the Revolution, “Grandola, Vila Morena” and they had a point. The people may have spoken, but eventually nobody was listening, because the system was the system, even if it had suffered revolutionary change and replaced the previous functionaries. Slovakia is not going to become more liberal, or more responsive to the popular will, through the election of Zuzana Caputova. What will happen is what always does – the system will simply find a way to embrace her ideas as part of the ones which existed before, as if the old politicians had held them all the time, and then relegate them further and further down their list of priorities until they become non-existent. In the 1989 European Parliament elections the Green Party did surprisingly well in the United Kingdom, where it had never been a significant force before. It still won no MEPs under the first past the post system then used there, but gained 14.5 per cent of the vote, easily good enough for third place, having achieved only 0.5 per cent at the previous Euro election. Faced with this radical alternative, the other parties simply adopted Green policies, which few people actively disagreed with but had not been considered important enough before. At the next Euro elections the Greens almost disappeared. The UK has since done its bit to adopt Green ideas like renewable energy, but only as much as the rest of the world, as these are all “add-on” policies, made increasingly less important by being adopted by the other parties, who have different overall priorities and constituencies of interest. It is common for people to be suspicious of politicians and with just cause. They expect to be lied to by self-serving egomaniacs, the same ones who do just the opposite when they get in power to what they promised as candidates. To a large extent this perception is justified, even though there is good reason for politicians faced with realities to act as they do. No one should be surprised that Slovakia and Ukraine are not immune to this trend. Both countries have been routinely derided for not being enough like Western liberal democracies. By the same logic, it makes sense that “popular movements” would spring up there, as these are not the exclusive province of tolerant countries, or the latest global bogeyman, whoever that may be . It is true that the only change Western commentators who are applauding these results want to see is how these states will become even more integrated into the Western system than before, whether or not that is what their peoples actually want. But even if they didn’t want that, is either country capable of actually changing? Politicians, like the poor, will always be with us. They can only operate within a political system, and whatever its complexion, whatever its terms, it will insulate itself from the people sooner or later. Slovakia and Ukraine have shown us that people have lost faith in themselves and their choices, not the politicians they once elected, or have at least have tolerated up till now. They are crying out for someone else to come along and get them out of their mess. If Uncle Sam was who he keeps telling the world he is, this would not be happening. Slovaks and Ukrainians have every reason to feel they have nowhere left to go, when they aren’t allowed to get there by the people who actually own the place. The result of the elections, first and second round will prove to be not really a game changer. It is likely that there will be more of the same, as the mentality and the reality of the system on the ground is not changing, only the names of those figureheads who can get elected by people who have no better choices—they vote against rather than voting for candidates.